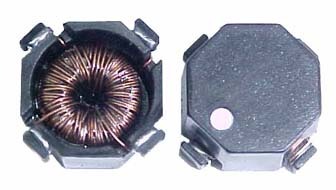 Surface mount magnetics that can be used as single or coupled inductors or 1:1 transformers that provide isolation between two windings SD types are designed around high frequency low loss material. IP types are lower cost versions of SD offering high saturation flux density HF offers higher current ratings and higher saturation flux densities than SD or IP types. Secure 4 terminal mounting Inductor more versatile inductance combination by series or parallel connections. Application areas include Computers and Portable power devices, LCD panels, DVD players, Inductors: DC-DC converters, Buck boost, foward, and resonant converters, Noise filtering and filter chokes, Transformers: 1:1 300 Vdc isolation, flyback, sepic, High current/Low voltage converters, High-speed computers, Video game machines, Output chokes, EMI filters. Storage temperature range: -40 deg. C. to + 125 deg. C.
Operating ambient temperature range: -40 deg. C. to + 85 deg. C.
Custom designs are available to meet your specific needs. Click the button to see examples of our custom wound products. We wind anything to meet your needs. Please see pdf files for details. See link below for some sample PDF files. email sales@coilws.com for larger volume OEM pricing. 4 ) The data shown below can be sorted by clicking each column header.Click once again to sort in reverse order.